Victor Gollancz – my first publisher, has now published this book. It is a splendid volume with a excellent cover design and is available at bookshops in the UK and in New Zealand, and in E format at SF Gateway, Amazon, The Book Depositary etc. If it is not already in your library, you may care to request it. The first full review I have received has now been posted on this website. The Disestablishment of Paradise is an epic tale of Love and Destruction on a strange planet called Paradise. It is concerned with ecological protection and was, in part, written in response at the horror I felt about the destruction of the Amazonian rain forests and other ecological disasters such as that in the Gulf of Mexico. What are we doing to our lovely world? A new vision regarding our relationship with the planet needs to be born and this can only be achieved by discovering where we have gone wrong. It is not the function of art to provide answers to questions, lest it become propaganda or more kindly, a manifesto – but it can help us ask the right questions. It reveals the human cost of bad ideas. The book may serve as a warning, a wake-up call. In writing it I went back to a technique used in both The Eye of the Queen and Wulfsyarn, A Mosaic: employing a story teller who can stand aside from the action and comment on it, thus allowing irony and discussion. In the present work the story-teller is Olivia Ginger, a writer of stories for children. Olivia has been invited by Hera Melhuish – the woman who stayed alone on the planet called Paradise while it underwent a final and terrible transformation – to reveal the truth of what happened during those final days. Olivia has also compiled documents to support and widen the reader’s experience of this planet. These are included as an appendix to the work and referenced throughout. The work is not an allegory nor does it offer any particular religion’s commentary; the name Paradise is used in a totally secular way. The book you are now holding reveals the experiences of Dr Melhuish during her last few months on the planet Paradise. Dr Hera Melhuish, let us recall, was the last human being to escape from Paradise. None have returned since and none will ever do so, for that planet is now closed to us. Absolutely. Thus this biography, as much a biography of that world as of the woman, while it does not end in death, has something equally final about it. It will come as a surprise to some readers that a writer such as myself, better known (if known at all) as a writer of books of fiction for children, should now turn my hand to a work of non-fiction, a biographical work no less. In explanation let me say that the preparation of this book was not an honour that I sought. The invitation was completely unforeseen. But it reached me during one of the darker periods of my creative life – a time that all writers know well – when I was full of doubt and seeking for a new direction. Thus the timing of Hera’s letter, as with so much else concerning Paradise, had a certain appropriateness. At that time, my knowledge of Dr Hera Melhuish consisted only of what was available on the public record. She had been director of the Observation, Regeneration and Botanic Expansion Project (ORBE Project) on Paradise at the time of the planet’s disestablishment. Dismissed from this position for alleged misconduct, she nevertheless contrived to return to the planet on a solo mission and was, for a significant period of time after the withdrawal of the colonists, the only human being on the planet. It was during this period that the planet began to exhibit a menacing evolution. After a near fatal accident, Dr Melhuish was joined by her ‘research assistant’ Mack – of whom more later. Together they discovered, and managed to save, the last living representative of the Dendron Peripatetica – the giant Wandering Tree of Paradise – hitherto believed extinct. Later Mack vanished – was consumed some suggested – after encountering a rogue Michelangelo with formidable psychic powers. Hera continued her journey alone across this increasingly hostile planet and was finally rescued just before the shuttle platform over Paradise began its final disintegration. These are the bare bones of Dr Melhuish’s story. However, it was the rescue of the Dendron which most caught the attention of the general public. Many of you will remember the programme Save the Dendron!, which was broadcast live from the surface of Paradise. It is estimated that the programme, in continuous transmission for almost three days, was witnessed by more people than any other programme in the entire history of tri-vid broadcasting! And it is fair to say that this one programme did more to awaken public awareness of the deep issues behind our journeying into space, than the thousands of documents and reports issued annually by the Space Council. For me, as for many others, this broadcast was a seminal moment in my life. For the first time I witnessed the kind of contact with an alien life form that I had dreamed about since being a child. Not only did the Dendron fulfil the deepest needs of my imagination, exciting me with its strangeness and vitality, but I was one of those many viewers who felt the impact of the creature’s psychic presence at the moment of its division. We were attending a birth, and while the delight of that moment has dimmed over time, its memory lingers in the most private parts of my being. It was a very pure and personal contact and any doubts I may have had concerning the cultural importance of alien contact were dispelled by what I saw and felt. In those few moments I became vividly aware of the possibilities offered by our venture into space, and at the same time critical of what we had accomplished to date. Before making a formal acceptance of Dr Melhuish’s offer, I re-viewed that programme. I also read most of Dr Melhuish’s published works, and this almost undid the entire project for I discovered that Hera Melhuish possesses fine writing skills. I could not understand why she could not undertake the task herself. The scathing prose of her political pamphlet Saving Gaia, is matched by the light-hearted humour of her stories for children. For those who do not know the work, Tales of Io and Me is a delightful collection of bedtime stories which have as their heroine a certain Little Girl who, not unlike their author, travels far-and-wide having strange adventures. Of Canals and Caves, a personal memoir, gives a spirited account of Hera’s diving explorations in the subterranean lakes on Mars and her discovery there of the luminous Burrow Worms. In Beyond Orion, written shortly after she joined the ORBE project on Paradise, Hera offers her vision of the possibilities and responsibilities resulting from space travel. The Fractal-Gate technology has opened new worlds – literally. Stirring stuff! I found in these books a vision in which I could share. At the end of my reading, I wrote to Hera. I had three main concerns. First, I freely admitted that my scientific knowledge was superficial. What I do not know, I invent – a practice well suited to fiction but hardly acceptable for a scientific enquiry. Second, I felt that Dr Melhuish, by the evidence of her own works, was well qualified to handle her own story. And finally, “Why me?” My strengths, such as they are, are in the fanciful, the dark and the mystical. When I come down to earth I become leaden. I prefer the storm to the rainbow. I have also been criticised because my stories are pagan in background and savage in event. In sum, I could name ten or twenty writers whom I would regard as more qualified than me to tell her biography. But of course, it was not really a biography that she wanted: it was an evocation. Her reply to me was characteristically direct. “To hell with the science. You can leave that to me, not that there will be much science in the story I want to tell. The nearest we will come to physics, is Pataphysics! If we talk briefly about ‘survival of the fittest’, we will talk longer about love and courage, reason and sacrifice. The first thing to realise is that most of the things that happened on Paradise cannot be explained in a rational way – which is not to say they don’t have a reason. Paradise was never rational in our way, and the challenge is to understand it in its own terms. That in turn will tell us about the greater reality of the universe. You wonder why I do not write my own story. The truth is I have tried many times – but am too close to it. When I try to write about those days, I find myself so close to the events that I become like a log of wood in the fire, unable to help myself or stop the burning. There is so much I want to tell. I want to reveal why Paradise was disestablished in the first place – that itself is a dirty story, and I, to my shame, was no saint. I want to convey the impact Earth had on that unblemished world and how it learned to respond in self-defence. I want to tell what it was like to stand inside the living body of a Dendron. I want to tell why my body is covered with the dark stains of the weeping Michelangelo, and to reveal in detail what happened to Mack, who is the unsung hero of all my adventures. Let me confess something. At the enquiry after my rescue from Paradise, I said that Mack was killed by a Michelangelo Reaper. That is not strictly true. Mack, who was dearer to me than my own shadow, chose to join with the Reaper, while I, who loved him and Paradise more than myself and would have stayed there willingly as a slave if need be, was, in effect, dismissed both by him and the planet. My consolation has been my memories, and my awareness that ‘they also serve who only stand and wait’. It was the pain and privacy of that parting which kept me silent for many years. Can you understand that? I think you can – for it is women’s logic, as old as time. But I knew I would have to speak out one day. Well, now is the time. Now, like the old Ancient Mariner – I feel an irresistible urge to tell my tale. And you must help me. You must question me until, like the sea in Yvegeny’s poem, I begin to yield up my monsters. Receiving this letter, I felt as though a door into a secret garden had opened before me. I did not hesitate. I stepped through. A few days later, I set off to visit Hera. I wanted to arrange how we were to proceed. And to be frank, I was more than a little curious to know what she would be like in the flesh. I was, of course, familiar with the tri-vid images of her: short of stature even for a woman, fine features, a stubborn jaw, enviably slim and with her long dark hair drawn back and pinned so tightly as to give her face an oriental cast. Even soused and gleaming with the sap of the Dendron, as I first saw her, she nevertheless managed to convey a somewhat neat and prim impression. Much of all this remains. She has neither put on weight or dwindled, and her voice for the most part retains a deep cultured tone. But the marks of Paradise are on her – her “love bites” or “ tear-stains” as she calls them. One is on the forehead and one on her right cheek. Her neck and arms are also marked as is, she informs me, the rest of her body. These marks have become darker with the passing of the years Sometimes they become sore and angry – at which times strange things must be happening on Paradise, for it is reaching out and afflicting her. If, when this resonance is really severe, she turns her gaze on you, she can, without meaning to, seem to stare coldly through you. It is the imperious look of a hawk or a basilisk. And she will apologize for this, when she sees you fidget. At those times, as I eventually came to understand, she is ‘resonating’ – a very important word if you wish to understand Dr Hera Melhuish – by which she means that she is both here and there, experiencing direct communion with distant Paradise while sitting in your studio. It took me a long time to accept this, and even now I do not really understand who or with what she is communicating. Lastly, as regards her primness, you will discover if you read on that there is nothing prim about Hera Melhuish – far from it. However, it is the raw energy of the woman which provides the most abiding memory and for which I was unprepared. It is there at all times, whether making a sketch with quick deft strokes, or cackling at some bawdy memory, gesticulating wildly for emphasis or pinning you with her bright eyes. That energy, she informs me, is the wild spirit of the Dendron which she received inside her mind and body and which now is lodged there, and which may, as she avers, keep her alive for many years or snuff her out without warning, either by accident or through an excess of love. Suffice to say that it is the loving, spirited Dendron rather than the dread Michelangelo which is the true alien in her, and for that we should be glad. We agreed upon a procedure. Hera would talk and I would record her words and ask questions to draw her out. The talk could ramble following its own logic. No topic, no matter how intimate, was off limits. And we would keep going until we had reached agreement or impasse. Arguing was also anticipated and proved unavoidable. We would meet as often as necessary. In this way, raw material was generated which I could then edit and shape as I saw fit. The style of the writing was left up to me. Hera’s preference was for me to tell a story and to treat her as I would a character in a novel. This proved remarkably easy. However, as I discovered more about Paradise and Hera, my view of the narrative changed. For example, sometimes when describing events in conversation, Hera attained a clarity that I could never have matched in composition, and I saw no need to improve upon what Nature had supplied. Thus I have frequently used her words as spoken during our interviews. Hera also wished me to avoid a specialist scientific vocabulary. ”We are not writing a text book” she said on more than one occasion. “Keep it simple and sweet.” Thus, while I might have relished sounding erudite, you will find that I frequently refer to the creatures of Paradise as ‘plants’ rather than ‘bio-forms’ or some such equally neutral term. I do this simply because that is how they were most often seen and spoken about even by specialists. But this must not blind us to the fact that, while there are distinct parallels with the botanic life of Earth, when we speak of the entities of Paradise, we are dealing with life-forms for which we have no real equivalent. Initially we met at Hera’s small apartment on Anchor-Hold-over-Europa. Later, as the project neared completion, we met at my studio on Albertini-over-Terra. During each visit Hera would read and correct what I had written. I was glad to observe that, as we progressed in the project, her corrections became fewer – a sure sign that either I was becoming more accurate as I grew to know my subject, or that she was forgetting and letting my imagined world become the truth. One difficulty we encountered from the outset, was that as a consequence of her calamitous departure from Paradise, Hera had lost all her notebooks, diaries, memoranda, pen and ink sketches, photographs, and so forth. They are still down there on Paradise no doubt, preserved in that lacquered state in which Paradise embalms all things of Earth. And so we talked. We talked long and late. We talked until I began to see through her eyes. Sometimes we talked until there were no more words and we just stared out into space or fell asleep where we sat. During one of our meetings, Hera said “I hope my story will help people think about what we are and how we fit into the scheme of things. What we need now is not more knowledge, but to understand what we already know.” It was with this in mind that she chose the final verse of Shelly’s Ode to the West Wind, to open this volume. I wish to conclude this introduction with two quite different images. The first is taken from a drawing which Hera made during her first visit to my studio. She called the sketch, The Horse and the Woodpecker, and I have it framed on the wall before me, even as I write. The sketch depicts two women – they could be sisters separated by a decade – sitting together at a wooden table. The room in which they sit is my studio – a bit junk-strewn, very cluttered, with books covering one wall and a transcriber tucked away in an alcove. There is an empty bottle of wine on the floor and a half-full bottle on the table between them. The women’s heads are almost touching as they study a sketch that the older woman is drawing. It is a Dendron in motion, its crest high and its flags waving. And yes, lest there be any confusion, I am the somewhat horsey one in the picture, and Hera the quick woodpecker. Behind the women, beyond the curved translucent wall, is the busy darkness of space, sparkling with stars. And there, in the centre, hangs the lapis lazuli disk of the Earth – blue and white and wholly beautiful in the full light of the sun. But they are not looking at the Earth. In their minds, they are many light years away, talking about Paradise. I hope you will think of this homely image when the going gets hard and we retreat from the comfortable and human. My second image is more abstract. 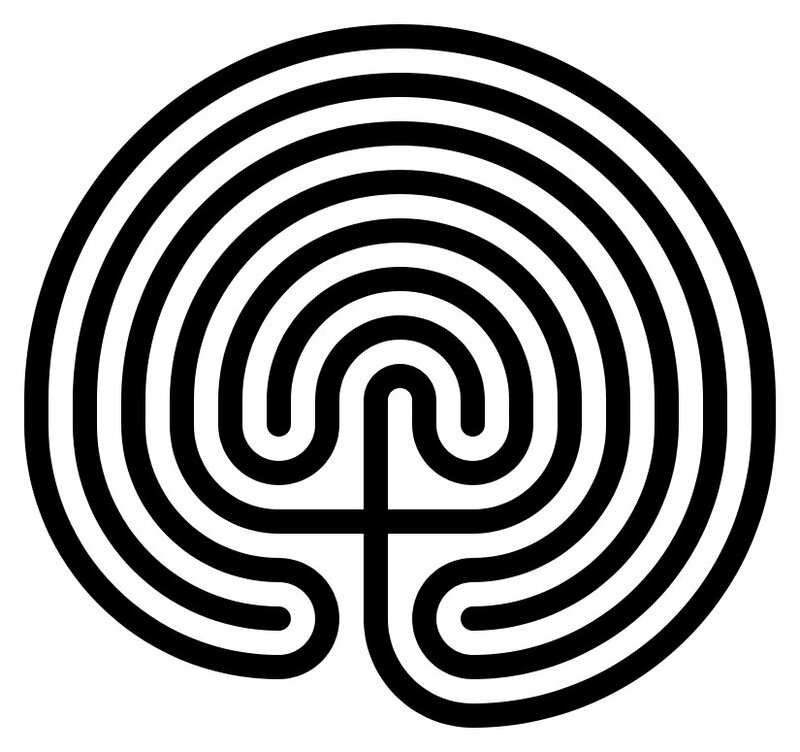 It is that of a labyrinth. A labyrinth is not a maze, it is a journey. You begin on the outside, but facing your desire, which is at the centre, whether that desire be to find yourself, or Jerusalem or Enlightenment, and you follow a path of knowledge. Once committed you cannot leave that path. Sometimes it is direct and your destination is clear before you. At other times it leads you to the side and this is a time for reflection, and the discovery of wider perspectives. Sometimes it seems to lead you directly away from your heart’s desire, and that is a dark night of the soul indeed, a time of severe testing when your closest companion is despair. But always the path of the labyrinth turns again. It approaches the point from which you began, but it is a new point, a new departure. And eventually, by being persistent, you find your way to your heart’s desire. That, at day’s end, is how I have come to see this work, and how I invite you to understand it. We begin with an introduction to Paradise. Paradise was named by the captain of the prospect ship Scorpion, the first craft to make its way there from the fractal gate Proxima MINADEC-over-Phobos. The captain’s name was Estelle Richter and she was just nineteen years old! We should remember that in the early days of fractal travel, only the young could cope with the stress of passing through the fractal threshold. The young are frequently more fearless, more optimistic, more confident of their sexual power and less afflicted by guilt than their elders. Such qualities were important in the early days of fractal travel – and still are, for they diminish the risk of nightmare. The Scorpion emerged from the temporary fractal gate established above the new world and the crew found themselves staring out at a shining green and blue planet with twin moons. Early indications of the planet were very positive. Measurements were made by means of an un-manned probe which touched down on the surface, first at a river delta and then at several other locations including the mountain tops and mid ocean. But it was obvious to anyone who cared to look that the planet contained life. It was there in the dynamic swirling clouds, in the bright blue seas and the lemon yellow lakes, in the sparkle of sun on water and the vivid green of the land. Can we for a moment imagine the excitement of those young pioneers as gathered round to see the results of all the automatic tests as they became available? Though slightly smaller than Venus, the new planet’s gravity was only slightly less than Earth normal – good for sport and dancing. The air was – yes, astonishingly! – breathable, according to analysis. It was perhaps even tonic being a bit richer in oxygen. And that was indeed H2O in the seas and rivers and not blue acid. And look at the tall trees which reached up with broad flat leaves. Look at the high waves crashing on the shore and the lime green meadows where you could follow the footsteps of the wind as it swirled up into the hills… Look at the red flowers bobbing like balloons in the valleys! All the colours could have been taken from a child’s palate. Strange only were the faint shimmering lines of energy, like the fading pattern of a rainbow, in the misty valleys: that, and the total absence of animals. There were no insects either or nibbling fish. Flowers without insects? Seas without fish? Why? Why? How? Captain Estelle Richter did not delay but decided to investigate immediately. As a name, Paradise was a happy choice. Unlike most worlds, this planet was not hostile to the kind of life that we represent. In ways beyond analysis, the air was sweet to breathe, the water pure, the seas buoyant, and there was a springy dense grass (later called brevet) for a tumble – and perhaps most extraordinary of all, fruits which were found to be edible. I am struck by the contrast between these young adventurers and the staunch, early astronauts from Earth who left their flags and boot prints and cars on the Moon. What a contrast too between new found Paradise and the molten or freezing, harsh, dark and sterile worlds the Scorpion crew had visited most frequently. Her companions did not delay but stripped off and followed their leader into the sea. There is an old saying that “innocence begets innocence.” If we believe this, then we can be confident that there was no damage done in this first meeting of species. But how interesting it would have been to peer into the mind of Paradise at the moment when Estelle bit the fruit or breasted the sea, for I am sure those contacts were keenly felt in that psychically alive and innocent world. As Estelle later explained, “When we came to leave I had one last swim. I have never felt such well-being.” And that evidently was what the crew of the Scorpion and most subsequent visitors felt during their first contact. I say most because a small but significant number of people have always found Paradise an uncomfortable place to dwell. I am saddened to report that the log of the Scorpion as well as other early visual recordings of Paradise (including details of its subsequent commercial exploitation) were lost in the catastrophic fire which destroyed the entire Proxima MINADEC-over-Phobos torus. The rumour, widely believed at the time, was that the fire was the result of arson and, though this was never proven, it is a fact that the directors of Minadec were under investigation for tax evasion and improper use of their prospect license. This loss of these early records is irredeemable, and one can only lament that, as with Hera’s own documentation, the records of Paradise have an awkward habit of vanishing ‘by accident’. Within months of the Scorpion’s visit, the planet was being opened up commercially, and MINADEC had a fifty-year license for all its activities. The miners, prospectors and lumberjacks that MINADEC sent to Paradise, while we know they visited and left their mark on almost every part of that planet, left few written accounts – graffiti apart. Their culture was essentially oral. It thrived at the well-head and the pit-face, round the campfires and in the mess huts. And like so much else of value, it died with them. We have some of their songs and drawings and letters – and of course there are the eye-witness accounts written by young Sasha Malik whose works we will dip into later. Many of the names used by the prospectors and miners became established. Thus the two moons which liven the night sky are called Gin and Tonic. The continents were named after certain distinguishing features. Chain, when seen from the air is a long thin continent which has many promontories and central lakes. Hammer and neighbouring Anvil require a more imaginative interpretation to see the likeness. Horse has one large headland which does resemble the head of a horse and Ball is… well, Ball is circular and that is all that one can say. Some islands are named after composers, some after the names of settlers, and some features, such as Baby Cry Falls record important evens such as the birth of the first child on Paradise. Upon expiry of the commercial license, Paradise was thrown open to agricultural colonists among whom one couple, Mayday and Marie Newton, wrote a daybook in which they set down in homely detail the day to day life of the pioneer farmers. These men and women, apart from being gifted visionaries with an urge to build families and create a new world, and who shared a common love of Paradise, were all trained in the basic arts of survival. They could both butcher and nurture. But by the time of their arrival, I suspect that Paradise was already turning against invaders. Despite their best efforts, agriculture on Paradise became harder as the years passed, and no one could explain why. During the first fifty years of colonisation, the animals – initially imported in embryo and raised with care – failed to prosper and eventually the last goats and horses died out. Fresh seed stock was brought in from Earth but this too, after initial success, gradually failed. Fruit would not set and seeds would not germinate, or when they did germinate were sickly. The formation of the Observation, Regeneration and Botanic Expansion project was the result of efforts to bring scientific expertise to bear on this problem. The failure of ORBE to make any significant difference to the agricultural situation was initially blamed on the lack of suitable equipment. Later it was claimed that the founder, Professor Israel Shapiro was only interested in his own research and had no real sympathy for the agricultural colonists’ dilemma. From my reading I would say that that is putting the matter mildly. He made it clear on numerous occasions that he found the presence of the “aggies” on Paradise irksome. On the death of Prof. Shapiro, Dr Hera Melhuish became Head of the ORBE project. She held this position for 11 stormy years. But even she, despite many initiatives, could not halt the gradual agricultural decline. And so we come to the fatal year of 2250 – the year of Disestablishment. When we enter her story, Dr Hera Melhuish is feeling well pleased with herself. After months of debate she has managed to defeat proposals which would have opened Paradise to tourism. Moreover, the ORBE project research, if not spectacular, is stable and well funded. Her own programme of native out-planting is going well. Her delight in Paradise is as great as that of Marie Newton or young Estelle Richter, though her aims are vastly different. And now she is doing what she most enjoys, “working in the garden” as she called it. It is a fine sunny morning and she is outside, her sleeves rolled up, tending the plants of Paradise. 1 For a lively early account of a Dendron in action, read Document 5 Shunting a Rex by Sasha Malik. I love Olivia’s account of Hera, Paradise Dendrons and the rest and can’t wait for my local independent bookshop in Ilkley to call me to say my copy’s arrived. Thank you James. I hope the copy arrives soon. where is the answer to the weighing of 12 balls quiz please? PS. Hope you enjoyed the book. Yes I thoroughly enjoyed your story and I found the alien world believable.Similar to and on par with a Sheri S. Tepper novel. As to the puzzle, thanks for the hint. More than a simple book “The disestablishment of Paradise” is something like a saga, a Space Opera. You built a whole universe.I especially enjoyed documents, something like speech of witness. It’s the best intersting part of the book. Reading them, it seemed to Me I was on Paradise. I imagined your books separated in 5 little books, one being documents. I didn’t really understand why Mack died. In any cas, the idea of a planet without animals but only plants is an very original ones. Lots of author imagined powerness of plants (“Hothouse”, Brian Aldiss for instance), but as long as I know You’re the only one to imagine a whole planet with plants without any animals. It was a difficult begining, sounds like a challenge for a writter! Have a good day, I suppose New Zealand where You live, is also another paradise. I agree with your statement that the ‘Disestablishment of Paradise’ is your best book since ‘The Eye of the Queen’. The smart moving plot easily carried the classical allusions (I am pleased Dinae made an appearance) and full-bodied text; an increasing rarity. There is less of ‘your’ voice in DoP, in fact, I strained to hear it. Congratulations and thanks for the experience. I realy loved the book.It moved me deeply. Goodness… no comments here since 2014??? I just finished the book and really enjoyed it. Epic world-building, such cool ideas. I loved the way the interconnection of all the planet’s life forms, and the humans’ effect on it, was revealed in the end. Ideas that bear some deep-thinking-about! Disappointed to see your books seem so hard to find here in Canada. Best wishes!